So per the recent NAMM coverage we know that there is a new compact version of the RevivalDrive coming down the line - and a raw prototype alongside likely facia design were on display at the show. 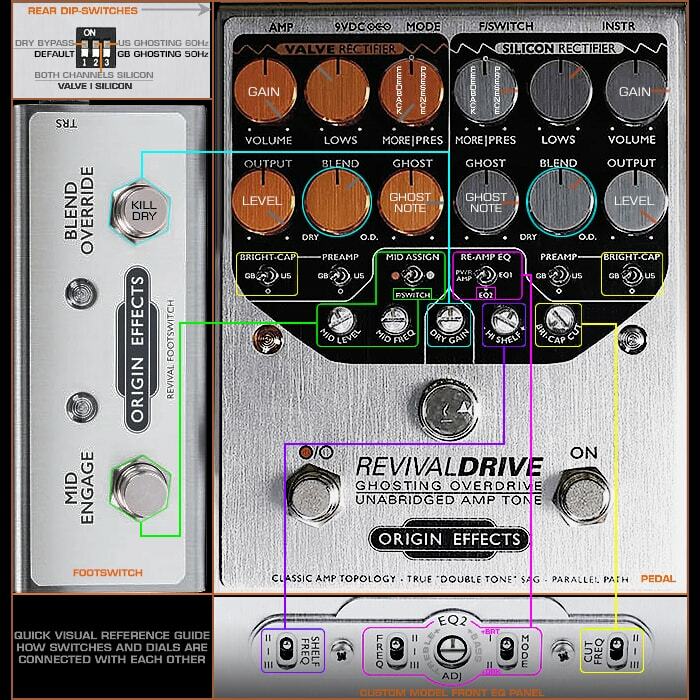 The RevivalDrive was my favourite new pedal of last year - I have the Custom version with all the additional EQ options - alongside the additional 2-button footswitch. I wrote in my ’RevivalDrive First Impressions Article’ how much I like this multi-drive/PreAmp pedal - and how I use all the EQ settings not just to tune the pedal to my specific amps, but also to find new and different tones and textures. So all-round I was and remain a big fan of the kitchen-sink original. The full-fat larger model obviously has a plethora of dials and switches across two channels - so it was evident that much would need to be stripped out for the compact edition. There is still the question as to whether there will be any dip-switches on the top edge of the pedal - to select between say Valve and Silicon Rectifier Voices for instance - or whether this pedal simply covers the more likely Silicon version only. As part of the strip-down we have lost the various GB and US PreAmp and Bright-Cap switches - and instead gained a ’Highs’ knob. From the original topology, the Ghost mode which I like so much has been sacrificed entirely. And below the 6 main dials - now in different arrangement - on the Origin Effects prototype there are just two further controls visible - the PowerAmp/EQ1/EQ2 toggle-switch and ADJustment/EQ Shift dial which you get on the front of the Custom version of the original pedal. I also find the Mid Level and Mid Frequency dials on the original an essential tool for further fine-tuning - I’m generally a huge fan of 3-band EQ. So in order to satisfy those needs - I have suggested two additional controls on m own mockup with simplified versions of the Mids and Ghost effects. For Mids - it’s just the same sort of dial per the ’Adj’ function, while for the Ghost effect I’ve gone for 3-way selector - None/Some/Lots which additions I believe would deliver a fully satisfactory or roughly 1/2 pint Compact version of the original. Note that in the top picture I have selected the simpler baseline version of the original RevivalDrive to convey the level and range of settings for that format - versus what can / is being carried across to the Compact. Note also that font values and element placement positions / ratios are approximations in my Compact mockup version. This is all just 'black-box' speculation really, as I'm not a pedal engineer and cannot guesstimate whether there is space within the Compact pedal internals to accommodate my 'Deviation Mockup' changes - this pictured example is however the version of the Compact pedal I would like to see. I don't doubt that the previewed planned version will be perfectly adequate for most players' needs, but to my mind it strips out a little too much of what made the original so essential. I cannot say whether my deviations would be easily accommodated, but that is the format I would find the pedal most acceptable in - alongside a switch on the top edge to select either of the Valve or Silicon Rectifier modes. I am not saying any of this is probable or possible even - I am just ruminating on idealised iterations of the proposed compact format pedal - and setting out the specs that would make it appealing to me. I fear I would be a lot less interested in the pedal in its current planned / prototype form - unless there are further settings around the sides or back that have not been revealed. This article is not a criticism of anything that Origin Effects are doing - just a prop for a discussion point really - and a sounding board for Simon Keats and colleagues to rationalise and explain what their intentions are and how and why they came to those decisions. I really love the RevivalDrive Custom in its current full-blown form, and am/was hoping for essentially around half of that pedal - obviously with a lot less controls as restricted by the available real-estate. I would love to know if my version is possible / feasible - and what the reasons would be for not considering such an approach? Would be good to hear from people who have other opinions and points to make on this subject - there are obviously players that like their pedals as simple as possible, while in this instance I'm really focusing on the task of miniaturising the original in such a way as to catch as much of the existing functionality that really makes is as special as it is!